It is fascinating what we can learn from nature. Some of the basic principles of cohesiveness, acclimation, and growth can be found in nature. We all have seen animals work together for a common cause. Many of us have seen bees methodically constructing a hive or ants collectively moving specks of dirt to build large living structures. One interesting finding is how geese instinctively work together and interact with each other for the good of the flock. Wildlife scientists have conducted studies to determine why geese fly collectively in a V formation. The results of the studies uncovered some rather interesting facts that can be applied to team building. Below is a listing of some of those facts and what we can learn from their example to create our own effective team. Fact #1 – As each bird flaps its wings, it creates uplift for the birds following. By flying in a “V” formation, the whole flock adds 71 percent greater flying range than if one bird flew alone. Geese have discovered that they can reach their destination quicker and expend less energy when they fly together in v-formation. The same can be said when people work harmoniously together on teams. By working together to achieve common goals, individuals arrive at the desired destination quicker and easier, because they are lifted up by the positive energy of others around them. People who share a common goals and sense of community can get where they are going quicker and easier because they are traveling on the strength of one another. Fact #2 – Whenever a goose falls out of formation, it suddenly feels the drag and resistance of trying to fly alone and quickly gets back into formation to take advantage of the lifting power of the bird immediately in front. When a goose falls out of the v-formation it quickly discovers that it requires a great deal more effort and energy to fly. Sometimes people working or playing on teams will drop out of the group and try to accomplish goals on their own. However, like the geese, they often find they need the synergy, energy, and collaboration that comes when they are part of a team, and want to return to the team. Fact #3 – When the lead goose gets tired, it rotates back into the formation and another goose flies at the point position. The geese in the front of the formation expend the most energy because they are the ones who must first break up the air flow that provides the additional lift for all the other geese that follow. Consequently, when the lead goose gets tired, it drops out of the front position and moves to the back of the formation, where the resistance is lower and less energy is needed. Another goose then moves to the front position to take on the job of breaking up the air flow. As members of a team, it helps to take turns doing the difficult tasks and sharing leadership responsibilities. When a team is functioning well, various members of the team may take the leadership role for a while because of a particular skill, capability, talent, knowledge, or experience. On highly effective teams, everyone has the opportunity to function as a leader and as a supporter. 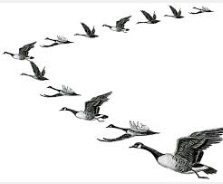 Fact #4 – The geese in formation honk from behind to encourage those up front to keep up their speed. When working on teams, it is important for each member to communicate regularly with all the other team members. Constant communication among members is essential for moving effectively towards a common goal or destination. However, it is essential to make sure our communication is encouraging to others and not discouraging. The power of encouragement can do wonders when it comes to overcoming obstacles and getting results. In teams where there is good communication, support, and encouragement, production is much greater. Fact #5 – When a goose gets sick or wounded or shot down, two geese drop out of formation and follow it down to help and protect it. They stay with it until it is able to fly again, or dies. Then they launch out on their own, with another formation, or they catch up with their flock. Like geese we too need to stand by each other in difficult times or when individuals are struggling. When one team member needs help, it is imperative for others in the group to reach out and assist the struggling teammate. Teams work best when they do more than just work together, but genuinely care for each other’s well-being.